Heat oven to 425°F. Bake rolls as directed on bag. While rolls are hot, brush with melted butter and sprinkle with garlic salt. Cut rolls in half. Spread cut sides of each roll with 1 tablespoon spreadable cheese. Top bottom halves of rolls evenly with turkey (folding to fit), cucumber, bell pepper and spinach. Cover with top halves of rolls. 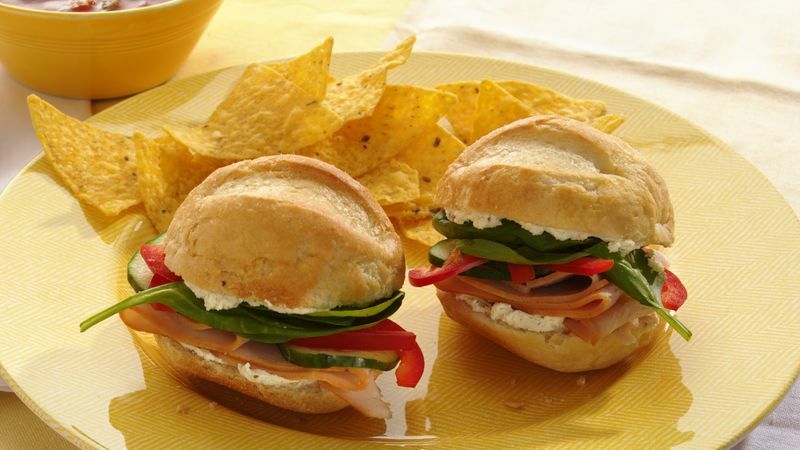 Other savory flavors of cream cheese, such as vegetable or onion, would be delicious in these tasty sandwiches.